Today I am doing another anime review, kupo! This weeks anime is No Game, No Life. I hope you enjoy reading! No Game No Life is a SciFi/Fantasy amine that follows two siblings, Sora and Shiro into an alternate world that is governed by gaming. Sora and Shiro start out as two reclusive adolescent (hikikomori) step siblings that live their lives playing games of all kinds. 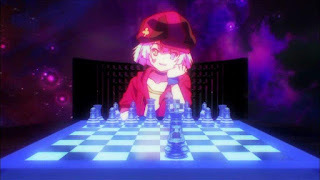 They pride themselves on being the best, from playing two characters at once in an MMO and defeating anyone that challenges them, to playing high tech chess AI that was designed to beat chess masters. They call themselves Blank, which is a play on the Japanese Kanji characters for Sora and Shiro. The story begins when Shiro gets a challenge by a chess player online. She realizes that the challenger is very clever and Sora jumps in to help. After winning the long challenging match they receive an odd e-mail from someone claiming to be from another world. 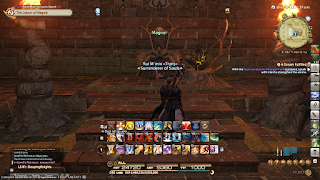 After accepting the invitation given by this mysterious player they get transported to a magical world where they meet Tet, a self proclaimed God of games. Tet explains to them that he is the God of this world, and every conflict is settled by games. There are 10 rules, or pledges that govern this fantasy world that everyone must follow. Sora and Shiro end up meeting a ditsy clumsy girl named Steph at an inn they are staying at, and learn that she is actually the princess of Elkia, one of the 16 nations in this world. Through their adventures they meet several other opponents turned allies on the quest to help Steph restore the kingdom of Elkia to its rightful place as the top nation. This anime gives me mixed feelings, but my overall opinion is a good one. From the feels to the articulate plot twists I was hooked from the first few episodes. Although there is plenty of comedy this anime is also full of heart wrenching moments that make the story. One of the biggest emotionally stimulating virtues of this amine is the relationship between Shiro and Sora, and how their sibling bond develops. Now don't get me wrong, at some points their relationship can be cringe-worthy due to the insinuation of insestial characteristics but I feel they did a good job at keeping it appropriate. Speaking of appropriation this anime has plenty of fan service and comedic elements. 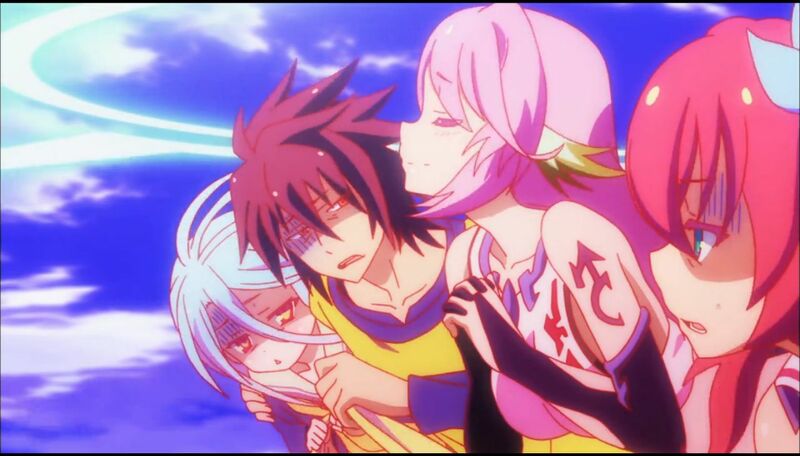 No Game, No Life is a series that straddles the line when it comes to morals at some points. Personally i'm not the type of person that enjoys fan service or perverted comedy, but again I think they did it correctly; It wasn't too much for me to make it through. Although the comedy doesn't do it for me, this anime has plenty of serious moments and does a good job of switching moods back and forth to maintain the correct mindset of the viewers during important plot points. They balance the mood during character development, plot and setting developments, and even back story explanations. Not only did they get this mood balance right, they also got the game culture correct. As an avid gamer and hikikomori myself, I enjoy that i can actually find anime such as No Game No Life with characters that I can relate with. I mentioned this same thing in my last review of Recovery of an MMO Junkie. Shiro and Sora, as well as Kurami ( a girl who they won against to become king) have very accurate personality traits of the type of people they are portraying. I think this is also why they included some fan service as well as the slapstick style comedy. A lot of introverted gamers out there will understand that online you get to be a different person. Even if they are depressed inside it usually comes out as trolling or other forms of harmless venting when online. Now in regards to character development some might have issues with our protagonists seeming to always win the games they play. Some might argue that this takes the fun out of this anime, but that couldn't be further from the truth! The simple fact that Sora always seems 3 steps ahead of everyone makes the anime interesting from my point of view. When I watch No game, No Life I feel i'm tasked with seeing how well the game plays out, and get excited about seeing how Blank is going to pull the win off. Again, this anime is definitely about the journey, not the outcome. Because of this, it can seem like a slow moving anime in the beginning, but after episode 4 when Tet reveals his true intent things take off to a fast pace. Although this can be considered a good thing due to it only having 12 episodes, I feel like they could have done a lot more with it. I'm not going to spoil the ending because this is definitely an anime that you need to check out, but they leave on a cliffhanger which is one of my biggest pet peeves. I'm sure we have all seen an anime that we fell in love with, It develops well, follows the source material well, makes you totally head over heals, you so excited for the last episode to see that final battle or conclusion, and then out of nowhere the episode ends in the middle of said conflict,and the protagonist gives a cheesy smile right before the credits roll almost as if to say, "Thanks for watching, if you liked this read the manga!!" No Game, No Life is one of these. They did so many things right; this is almost a form of self destruction. This was so unfortunate for such a great anime, but alas this is my only big complaint. They did make more content with the release of No Game, No Life: Zero, however instead of it being a series sequel it was a film prequel. I will save my views on Zero for another review, but I will say I enjoyed it as well. Unfortunately however it didn't add anything to the continuation of the series. Well, I'm going to end this review here, I hope you enjoyed this review. I definitely encourage you to check out No Game No Life, I promise it wont disappoint. No Game No Life is available for legal streaming on Hulu and Crunchy Roll.